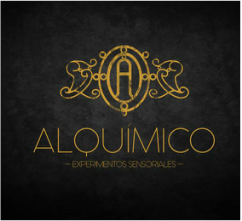 Building upon the secret experiments of the alchemists of yore, Alquimico blends the science of a good cocktail, electric vibes and a magical setting to turn your Cartagena night into gold. Woah. Metaphor. They call this modern alchemy "Sensory Experiments", and basically it makes for a really fun/tasty time. First of all, visually, it's a veritable feast. Extravagant red curtains, giant glass jars glowing with mysterious contents, that epic square bar, those striking twin staircases, massively high-ceilings, columns, and distressed finishings and old wood and patterned tiles. There's texture and cool detail everywhere you look. It was more than a work of Alchemy for its owners to transform the neglected but incredible former mansion and warehouse, to the golden example of bar design we see before us today and my, wasn't it worth it. The vibe varies depending on the time and the day.. chill after-work wind-down drinks can have a tendency to become frenzied rum-fueled fun around about 11pm. The music helps. If you've had your fill of solely latin playlists, here is your aural sanctuary. There might be some tropical funk, disco or even some on-point hip-hop (oh my god yes, finally, thank you). As a dance-aholic I feel obliged to report that there isn't a designated dancefloor space.. but that seems to have the benefit that the dancing energy spills into every space and the vibe is so fun you find yourself ordering round after round. So about those drinks. The interesting thing about Alquimico is that they make a bunch of house cocktails based on spirits they have infused in-house (that's what all those glass jars are). My personal favourite is the Salitre with ginger rum, rose salt, tahitian lime. A decent amount of spice and the citrus tang have me won. But the smoked coco is probably the specialty. These house cocktails are a great-valued 19,000 pesos. Stepping up to the Bartender choice menu, here you will find cocktails mixed with more premium spirits developed by the different members of the barkeeping team. The food menu is new and from what I've seen and tried, it's pretty darn good. Any place that brings the beloved Bahn Mi to asian-food-starved Cartagena has a loyal client in me. The plates are designed to be a complement to the drinks. Smoked potato milllefille pairs super well with a smoky whisky-based tipple. The mini share jars of bread-spreads are a great idea. And the ceviche is one of the best and best-valued I've tried in the city. Alquimico is without doubt one of the best drink/play options in Cartagena. Good for dates, groups, solo barstool people-watching, sports-watching, spontaneous dance erruptions and ofcourse, sensory experiments. Gold.